PWP has successfully completed the first annual renewal review campaign to identify outdated and abandoned websites and ensure websites have proper administrative contacts. Thank you so much to each site administrator who renewed your website, reached out to the PWP team with questions, or processed your unneeded website for removal. We will be repeating the site renewal campaign for Fall 2019. However, all of you have provided incredible feedback and further insight into our process, so we will be delivering a better site renewal experience for you in the future. We started our Fall 2018 site renewal campaign in October 2018 to audit the health, administrative custody, and upkeep of our user-owned websites. We provided a two month window for site owners to log into PWP, go to their site dashboard, and click the Renew this Site button. By the renewal due date (December 14th), 432 out of 866 (just shy of 50%) of our websites had renewed. Given its proximity to the December holiday season, we decided to delay any further communication on non-renewed websites until early January 2019. During that time period, an additional 16 websites renewed. On January 10th, the remaining 416 websites were contacted about their renewal lapse and provided an archival timeline: non-renewed websites would be archived on January 25th and then deleted on February 25th. All 416 websites were contacted on January 10th via email, including the 117 websites with no active campus administrator account. Our process resulted in 538 websites renewed, which resulted in 286 websites being archived. PWP re-enabled 23 websites after the archival deadline. If you are a PWP site owner and your site was archived due to non-renewal and you still need the website, please contact PWP administrators as soon as possible. 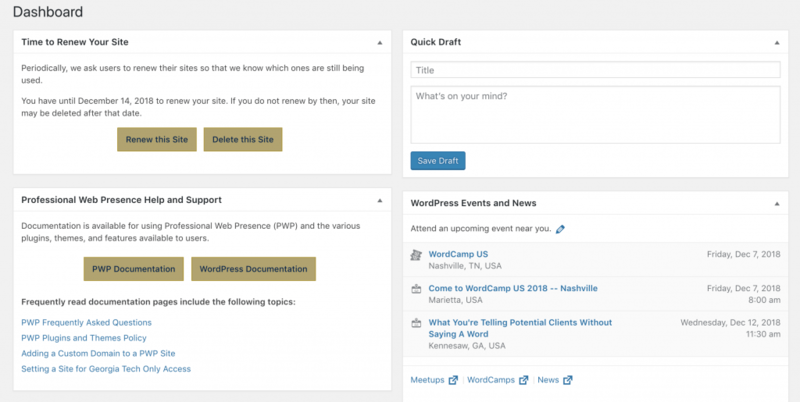 Next Next post: WordPress 5.0 update: hello, Block Editor!